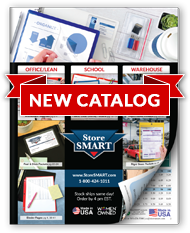 Whether you need to label warehouse locations, streamline your shipping processes, create custom labels for order and process tracking, or set up an eye-catching visual factory display, StoreSMART's Velcro Back Plastic Label Holders offer you the ultimate in strength and versatility. Each 8-gauge crystal clear vinyl holder is open on both short sides for ease of use, and designed to fit standard ½" x 6" or 7⁄8" x 6" labels. The strong velcro backs give you the ability to stick them wherever you like. Keep your business organized! Opens on both short sides with a ¼" lip. Overall size: 1 1⁄8" x 6 3⁄8". Inside capacity: Fits ½" x 6" or 7⁄8" x 6" labels. ½" x 6" veclro strip on back, hook side only.